My family has a habit of giving me international cookbooks – in 2009 they gave me Maria Baez Kijac’s South American Table after I noticed I had recipes from every habitable continent but South America. 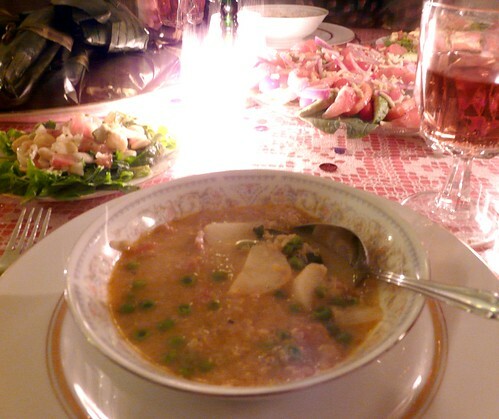 Not sure how that happened, but I made up for it planning our Christmas menu, which included this soup along with salads and yuca and tamales – and ham, since we always have ham for Christmas. 1/4 cup quinoa, washed and rinsed in several changes of water. 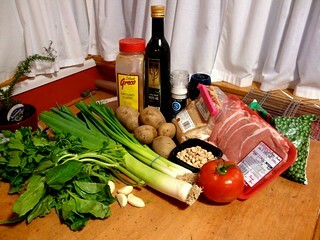 This may seem like far too many ingredients, but it’s really not a difficult recipe – the preparation time is much less than the cooking time, so plan to have it cooking in the background while you work on other things. 1. Heat the oil in a dutch oven over low heat. 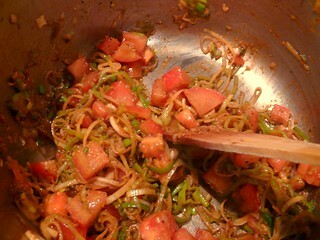 Stir in annato, then add scallions, leeks, tomato, garlic paste, salt, pepper, and cumin and cook, stirring occasionally, for 5 minutes. 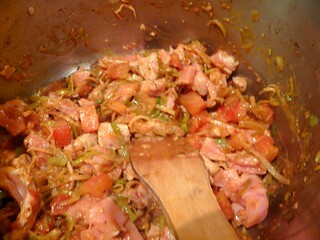 Increase the heat to medium and add pork cubes, then cook and stir until well coated with vegetable mixture. 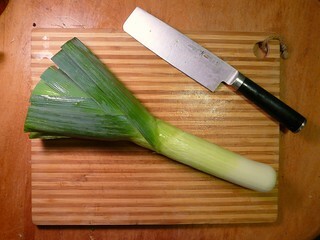 Add water and bring to a boil. Cover, reduce heat to low, and simmer for 45 minutes. 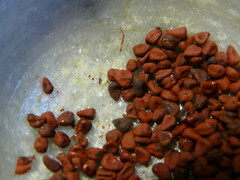 Annato is a seed that provides a bright color in cooking but not a strong flavor. 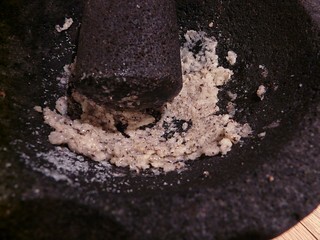 The seeds are very hard and difficult to grind, so if you can’t find any in your area it’s fine to use paprika as a substitute. If you do have access to a Latin American grocery store and plan to cook this way frequently, an easy time saver is to sautee equal portions of seeds and canola oil until the oil turns a rich orange color. 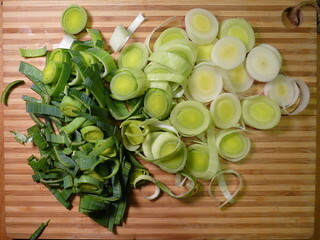 Strain out the seeds and use the oil in recipes like this – it will last several months. 2. While the soup simmers, place quinoa in a medium saucepan with 1/2 cup water and bring to a boil. 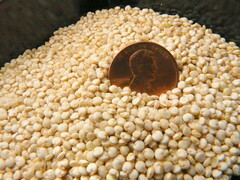 Cover, reduce heat to low and simmer until quinoa has absorbed all the water, about 12 minutes. Remove from heat, fluff with a fork, cover and let stand for 5 minutes. 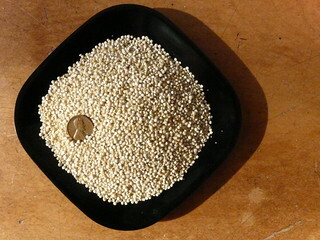 If the quinoa tastes bitter, rinse with cold water until bitterness disappears. 3. Puree peanuts with milk in blender. 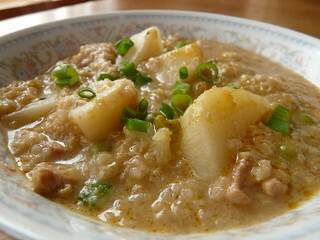 Add with potatoes and quinoa to soup pot with peanut sauce and cook until potatoes are tender, about 20 minutes. Add the peas, basil, and cayenne and cook just until peas are heated through. Taste for salt and pepper. 4. Serve hot, garnished with parsley.